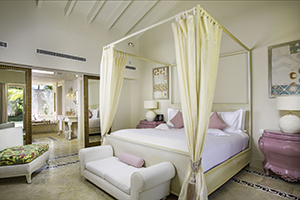 Eden Roc Cap Cana is a five-star Relais & Chateaux resort nestled in Cap Cana, the most exclusive gated beachfront community of the Dominican Republic. The 30,000-acre community is home to pristine beaches, towering cliffs and tropical forests, a bustling marina, and the number #1 golf course in the Caribbean and Mexico. Blending the impeccable standards of the French and Italian Rivieras with the warmth and relaxed charms of the Caribbean, Eden Roc Cap Cana presents glamourous suites with stunning views, elevated dining of local and international cuisine, and a sophisticated oasis at the exclusive Beach Club at Eden Roc. 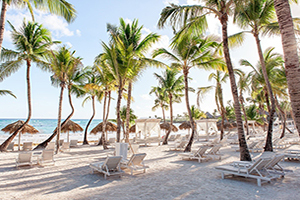 Located along the coastline of Punta Cana on the eastern tip of the Dominican Republic, part of a 30,000-acre master planned luxury resort and real estate community amid pristine beaches, towering cliffs and tropical forests. 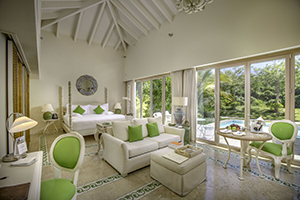 Designed for complete privacy, each of the 32 Boutique Suites and 2 Villas is an oasis of tranquility and style with its own swimming pool and spa/relaxation area. With stunning ocean view terraces and balconies, the ambiance of the 26 Beachfront Suites exudes the most exclusive experience while the newly unveiled 4 Oceanfront Pool Bungalows provide an intimate stay with vast wrap around terraces overlooking the stunning Caleton Beach. 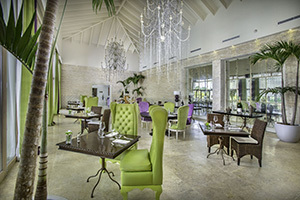 Mediterraneo Restaurant is the main restaurant of the hotel and presents an unparalleled Mediterranean dining experience. La Palapa offers fish and seafood dining prepared to perfection, BLUE Grill + Bar features Nikkei and robatayaki cooking techniques and a rotisserie. Solaya Spa offers world-class treatment surrounded by lagoons. Jack Nicklaus Punta Espada golf course in Cap Cana surrounded by towering cliffs and pristine waters. 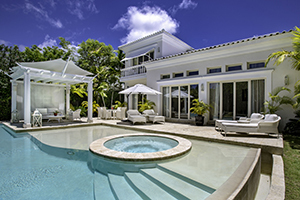 64 all suite accommodations: 32 free-standing luxury pool suites, 2 stunning villas with 3-4 bedrooms, 26 two-bedroom beach front suites, and 4 exclusive ocean front pool bungalows. 3 Relais & Chateaux restaurants and 3 bars that come to life with a distinctive personality through a combination of striking décor and elegant atmosphere. Exclusive access to Eden Roc Beach Club, less than a 1,000 ft. from the main hotel area. 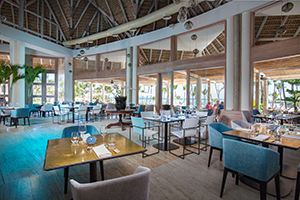 Complimentary Daily breakfast served at Mediterraneo Restaurant or BLUE Grill + Bar. Private airport transfers to and from Punta Cana International Airport. Room service 24/7 and personalized concierge service. Leisure activities include water activities, private boat trips, tennis, sunset catamaran tours, scuba/snorkeling excursions, wine tastings and more. Koko Kid’s Club features all sorts of activities and services for children aged 4-12 years.